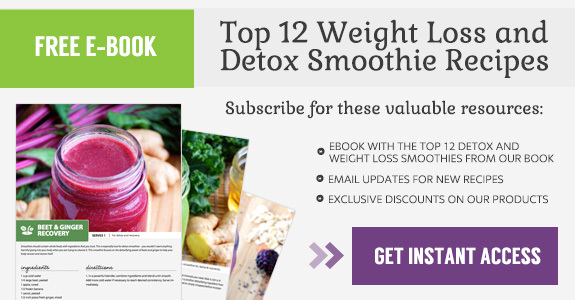 This sweet and spicy smoothie was an instant favorite. 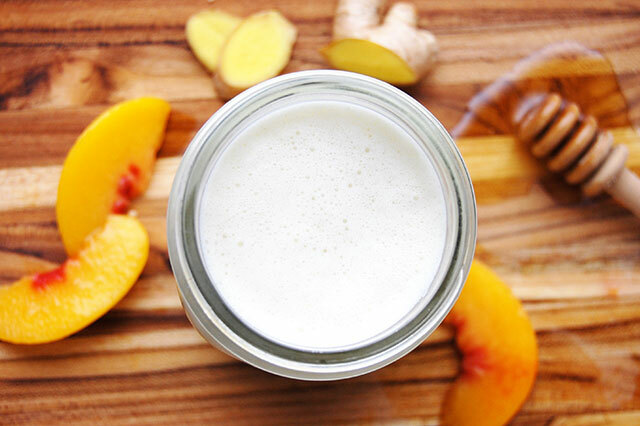 Aromatic ginger and sweet peaches make a delicious combination in this creamy drink. Fresh ginger has been used for thousands of years for its medicinal properties. Pick up a small ginger root from the grocery store – one that is still firm, not soft. Shave off the skin, and then use a microplane grater to finely grate the ginger. Fresh ginger provides pain relief for muscle and joint pain since it is anti-inflammatory. It is also widely used for helping with nausea or an upset stomach. 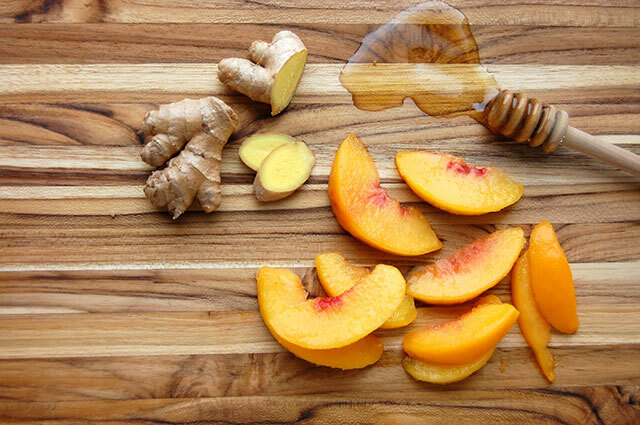 Peaches are used to balance the spicy ginger in the smoothie. 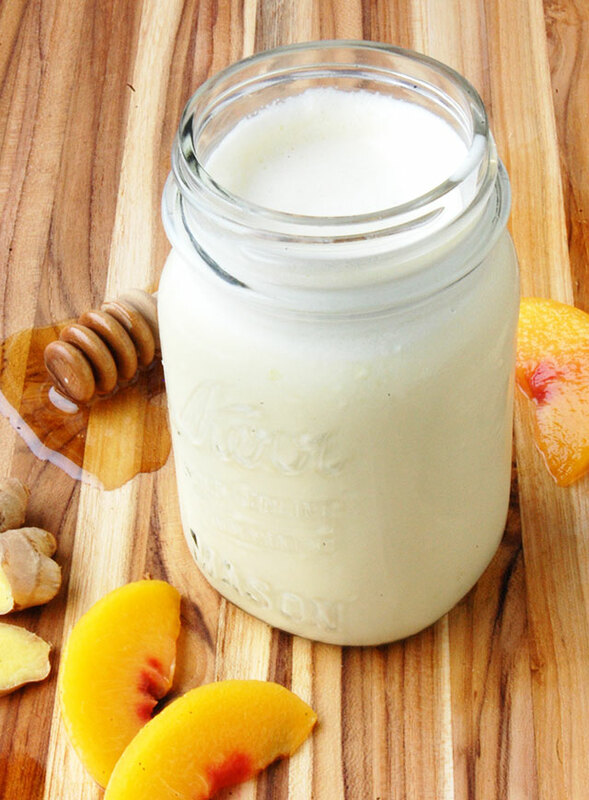 I prefer this peach smoothie in the middle of the summer when fresh peaches abound. Their soft skin and sweet juicy middle are irresistible. You could also freeze the peaches and enjoy them all year around! Frozen peaches add a natural sweetness to this recipe, and also omit the need to add ice cubes. Peaches also add a lot of vitamins to your diet. They are a large provider of vitamin A, which helps your vision, and also of vitamin C, an aid to the immune system. Also high in fiber and potassium, they can help flush toxins from your colon, kidneys, and liver. Besides ginger and peaches (the two main health benefactors to this smoothie) honey and coconut milk are also added. Peaches and honey, just like peaches and coconut, are classic combinations that enhance the flavors of the drink and will make this a fast favorite.